(15/P30) TRENTON – A map detailing New Jersey’s statewide geologic formations has been updated with the latest science and mapping information. It commemorates a map first published more than a century ago, Department of Environmental Protection Commissioner Bob Martin announced today. The new poster-size map, developed by the New Jersey Geological and Water Survey within the DEP, will prove useful not only to geology lovers but to engineers, well drillers, planners, educators and other professionals. The vintage 1914 map has been in demand but out of print for many years, despite numerous re-printings by State Geologists Henry B. Kummel in 1931, Meredith E. Johnson in 1950, and by Kemble Widmer in the early 1960s. For its new look, the updated map was compiled with data from a cooperative mapping program between the NJGWS and U.S. Geological Survey. It was produced by a team of geologists including Richard Dalton, Donald Monteverde, Peter Sugarman and Richard Volkert. Founded in 1835, the NJGWS is one of the oldest Geologic Survey organizations in the United States and has an honored history of producing maps and documents depicting and describing the geology of the Garden State. This latest publication continues the organization’s 180-year-old mission to provide important information about earth science. 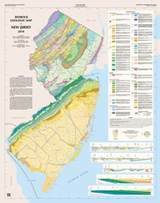 For additional details about the updated bedrock geologic map, visit: http://njgeology.org/enviroed/newsletter/v10n2.pdf. To purchase a copy of the new map, which costs $20 and includes shipping, visit: http://www.nj.gov/dep/njgs/pricelst/bedrock250.htm.